The fastest, best equipped 8000 pound winches in the industry. 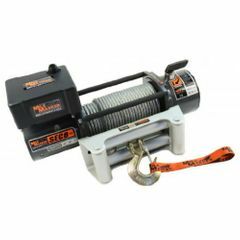 Boasting blazing line speeds, a high output series wound motor, and an anodized aluminum hawse fairlead, these are the essential winches for overland explorers and competition rigs seeking to quench their adventurous thirst as they traverse the globe’s harshest conditions. Backed by Mile Marker’s two year warranty (one on the solenoid), and 30 years of manufacturing expertise.